Bunnahabhain offers a Single Malt with the typical character of the distillery but aged in Sherry casks. This is a first edition that pays tribute to the helmsman of the distillery. The sea marks all the Single Malts of Bunnahabhain because they are aged in the coastal cellars of the distillery. This marine influence is very present in the vibrant Stiùireadair (pronounced stew-rahdur). Meaning "Helmsman" in Scottish Gaelic, Stiùireadair, is the first edition of Bunnahabhain to pay tribute to the helmsman of the distillery that adorns each bottle. Kirstie, the master blender from Bunnahabhain, has selected first and second filling Sherry casks from different ages and locations in the cellars to recreate a "sea storm" in the glass of whisky. 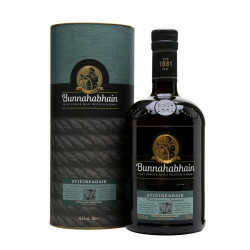 This Single Malt is a version aged in Sherry casks of typical Bunnahabain whisky. It is a potential replacement of 12 years old release. This whisky is round, ample and maritime. It expresses hints of caramel, nuts, dried fruits and slight hints of spice. Established in 1881, the Bunnahabhain distillery has developed a unique style inspired from its legacy. Its philosophy is to offer the most natural whisky, almost completely hand crafted and aged on the famous Isle of Islay. Bunnahabhain means the “mouth of the river” in Gaelic. It is located at the mouth of the river Margadale, on the strait that separates Islay from the Isle of Jura, in the north. It has always been a famous land mark for Scottish sea-farers coming back home. The mariner we can see on each label of Bunnahabhain whisky is inspired by this anecdote. Bunnahabhain is a noble, light and delicate whisky characterized by an exceptional mellowness and a hint of peat. In the beginning, the distillery produced an oily, peated whisky with its own malting house and its peat kilns to dry the malt. Only in 1963, with the arrival of new owners, the distillery turned to a non-peated, malted barley from which originates the fruity, spicy and maritime character of the whisky, without any peat. Over the last few years, the distillery rediscovers its legacy with the limited editions of highly peated whiskies such as the Cèobanach, meaning “smoky mist” in Gaelic, succeeding to the “Toiteach”. Palate: creamy, fruity, hints of cinnamon and clove with a salty touch.